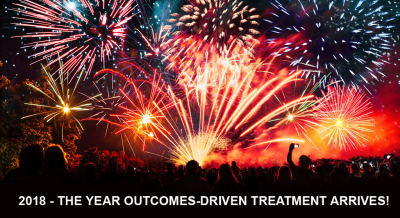 2018 - The Year Outcomes-Driven Treatment Arrives! The behavioral health care industry has been far behind other areas of health care in using patient-reported data to improve treatment results. But 2018 is the year this is going to change! Finally, there’s an easy-to-use software system that monitors how patients are feeling during treatment and graphs the results in real time so clinicians can use it to inform clinical care. Leaders of behavioral healthcare organizations who understand the value of patient-reported data are signing up en masse for INSIGHT Addiction™ and INSIGHT Behavioral™. Gone are the days when behavioral health care organizations were forced to rely on simple, one-dimensional surveys that totally ignored the complex issues patients are struggling with today. INSIGHT Addiction™ screens patients online for addiction severity, depression, anxiety, trauma, eating disorders, suicidal thoughts, self-harming behaviors, cravings, drug and alcohol use, and satisfaction with treatment. INSIGHT Behavioral replaces the addiction-specific measures with mania, psychosis, functioning and medication adherence measures. When patients answer a screening question for a disorder positively, INSIGHT uses an academically-validated scale to measure the severity of their symptoms of that disorder. All results are reported back to the patients’ clinicians in real time in easy-to-understand graphs. Clinicians are automatically alerted to incoming reports, and INSIGHT texts or emails patients directly when it’s time for their next surveys whenever possible. In addition to making the process of collecting and viewing individual patient data almost effortless, INSIGHT also provides the quarterly audits and comprehensive reports that managers need to understand how their treatment outcomes compare to those of similar programs and whether they are improving over time. And all INSIGHT clients will be invited to an Outcomes Summit this spring where they’ll have the opportunity to review preliminary reports of their outcomes and brainstorm with their peers about ways to further improve. We’re very excited to be helping our innovative clients harness the power of patient-reported data to improve their behavioral treatment results. If you’re a progressive leader in the industry, please join us!